You might have noticed that we love stories. I think we’ve reviewed storybook apps of all kinds: fables, fairy tales, steampunk, comedy. But we haven’t seen many apps that let you choose your own story, such as this app by Silvia Carbotti: Tale of Tales. Tale of Tales is an interactive story maker suitable for kids ages 2—5. The idea is that kids randomly select scenes from different fairy tales to create an entirely new story each time. The app presents a mixture of familiar faces and original characters; at one point I was reading a tale which starred a sentimental gnome, a donut monster, and Little Riding Hood in a faraway land where the roads made of sweets. To begin the story, kids first choose a language: English or Italian. A narrator, in the selected language, then prompts them to choose from five colored dots. These dots will lead to the next scene in the plot. There are no previews, so kids won’t know what is going to happen until they make a selection. Once a scene is selected, kids must again tap on a colored dot to continue. This step is then repeated until they reach the end of the story. But while the stories in themselves are short (each story is exactly five pages long), it takes a while to fully explore the app. This is because it offers 25 different scenes, which translates to over 2,000 possible story combinations. Finally, like most digital books nowadays, Tale of Tales is interactive and fully narrated. Kids may tap on various objects to discover hidden surprises, and even blow into the iPad’s microphone to blow a gust of wind into the scene. Tale of Tales is a simple app with few settings. Kids simply tap on the colored dots to move onto the next scene, and the star button at the top left to go back to the main screen. As mentioned, the stories are fully narrated in English or Italian. Kids may repeat the narration on each page by tapping on the text. A fun addition is a set of coloring sheets which feature many of the objects and characters in the story. These sheets can be downloaded from the developer’s website. The app doesn’t have ads and in-app purchases. Social media links are present in a secured section intended for parents. Tale of Tales is a lighthearted app that promotes creative play. By allowing kids to mix their own story, the app encourages kids to imagine and think out of the box. One thing that I really like is that the stories in the app have a solid structure: there is always a set beginning, middle, and end. This is valuable for teaching kids about the structure of stories. The app also looks and feels good. The illustrations are bright, colorful, and appropriate for kids. The interactive parts are playful and enough to keep young readers engaged. One of my favorite scenes is where I could tap on a lone star and various constellations will appear. I also liked spinning the little mermaid around in a bath full of bubbles. Tale of Tales is a creative app that encourages toddlers and preschoolers to invent their own stories. The create-your-own-story mechanism is intuitive and helpful for introducing kids to the structure of stories. 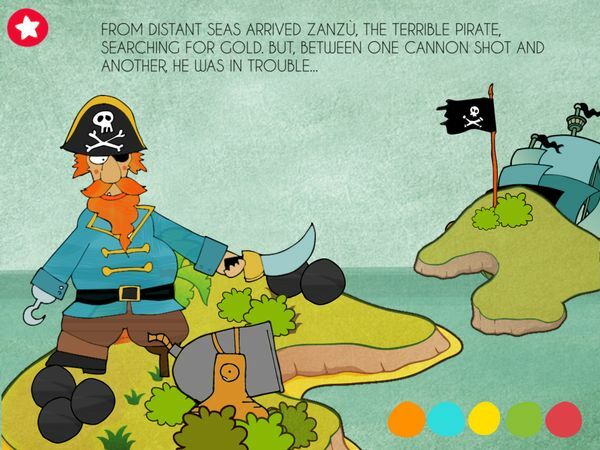 With over 2,000 possible story combinations, the app is sure to keep young readers entertained.